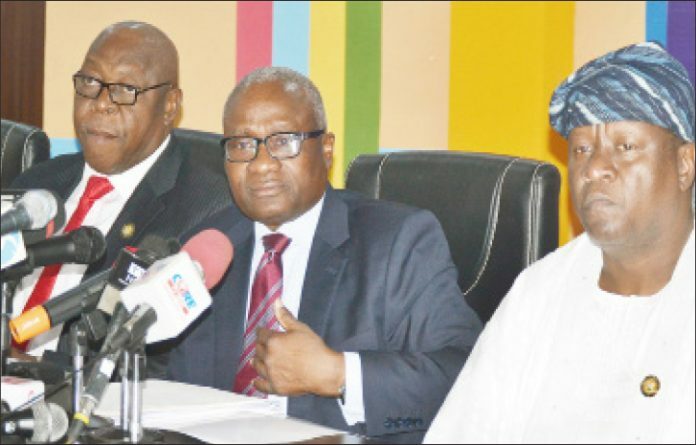 L-R: Dr. Olufemi Onanuga,Special Adviser on Primary Health Care; Dr. Jide Idris, Commissioner for Health, and Mr. Kehinde Bamigbetan, Commissioner for Information and Strategy, during the annual ministerial press briefing of the Lagos State Ministry of Health held at Alausa, Ikeja, weekend. Mrs. Betty Anyanwu-Akeredolu, the wife of the Ondo State Governor has called for collaborations among key players in the heath sector towards ensuring effective cancer control in the state. Speaking at the BRECAN lunch meeting with all health professionals in the state at an event which took place at the multipurpose hall of the Federal University of Technology, Akure, Mrs. Akeredolu reviewed some of the activities of BRECAN over the years. She noted that the focus has always been on early detection even as she encouraged government to improve its policies and funding for cancer control. She also highlighted the importance of crowd funding campaigns, while urging major players in the health sector to key into the initiative so as to ensure that the advocacy reaches all nooks and crannies of the society. In his presentation, Dr. Kingsley Ndoh, a Clinical Assistant Professor, University of Washington and Consultant, Ondo State Cancer Control Programme gave an overview of the successes so far recorded to include the support and delivery of equipment from foreign partners among other things. While noting that the strides of Mrs. Akeredolu is the commitment of the state government to build a cancer treatment centre in Ondo State, Dr. Ndoh further affirmed that appropriate legislative backing was appealed for from the state house of assembly towards ensuring that cancer is no longer a death sentence. In his remark, Dr. Wahab Adegbenro, Commissioner for Health in the State, while pledging to incorporate training of health workers on self-breast examination into the system, affirmed government’s commitment to managing cancer in the state. .In her presentation, Dr. Teniola Akeredolu stressed the need for collaboration between key stakeholders in the health sector. Earlier in lecture, Dr. Ndidi Okunuga noted that available statistics from Akure, the Ondo State capital, shows that there is an average of 80 cancer cases per year. According to her, there was a need for a comprehensive cancer control which would encompass having more pathologists on ground to attend to patients, more scientists to conduct researches and as well the establishment of standard diagnostic labs among others. Dr. Toyin Ayimoro, Ondo State BRECAN state chairman, while delivering her lecture on Building Partnership with community gatekeepers in cancer awareness and advocacy called for all hands to be on deck to curb the spate of cancer. Dr. Ayimoro who frowned at the fact that there are no adequate resources on ground to treat cancer patients underscored the need to strengthen partnership among all. Highpoint of the event came with the verbal commitment of key stakeholders to continue to support the cause. Meanwhile, Anyanwu-Akeredolu has received a pat on the back for her endless commitment towards raising awareness on breast cancer in Nigeria. The Vice-Chancellor of the Federal University of Technology, Akure (FUTA), Professor Joseph Adeola Fuwape, gave the commendation during a lunch meeting organised by BRECAN at the multipurpose Hall, FUTA, Ondo State. Professor Fuwape observed that BRECAN has been a notable champion in creating awareness of the life-threatening disease and expressed FUTA’s readiness to partner with BRECAN towards fulfilling its mandate.